On this page you will find links to information and commentary about the HHS Mandate and in particular, the Priests for Life case against the mandate. Priests for Life Attorney Robert Muise, Co-Founder and Chief Counsel of the American Freedom Law Center stated, "This case with Priests for Life is the lead case for the non-profit religious organizations challenging the mandate similar to how Hobby Lobby is the lead case for the for-profit companies challenging the HHS mandate." Hobby Lobby CEO David Green expressed his solidarity with Priests for Life and the other religious, non-profit groups. Yes, Fr. Frank, I stand with Priests for Life in this case! I know that it is particularly appropriate that Priests for Life has been fighting this mandate, since the very purpose of the organization is to oppose the very activities that the mandate supports, particularly abortion. 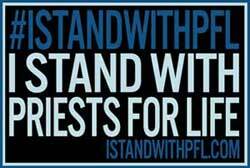 Please count me in as someone who stands with Priests for Life and let the media and members of Congress know too!